The Crystal Ball, a Ball that brought in Cebu's (and a sprinkling of Manila's) gliteratti and literatti was a fitting way to celebrate Zee LifeStyle Magazine's 15th Year Anniversary. Dynamic Lady publisher Eva Gullas, the moving spirit behind ZEE, did not spare any detail to make the event shine like a Crystal Ball should. The Santa Maria ballroom at the Radisson Blu glittered with the BLING BLING of the fashionista ladies and the crystal candelabras on top of all the tables illuminated the dimly lit ballroom. The five course gourmet nouvelle cuisine dinner by Radisson Blu's top chefs satisfied even the most discriminating palate. The proceeds from the Ball's auction went to Zee's favorite charity. Gowns from Cebu's top designers, (Cary Santiago, Phillip Rodriguez, Jun Escario, OJ Hoffer, Arcy Gayatin, Hans Coquilla, Ronald Enrico, Philipp Tampus, Dexter Alazas, among others) were worn by most of the ladies present there. There was a fashion show in the adjoining part of the ballroom after the dinner. Seven designers participated-- Philip Rodriguez, Jun Escario, Yvonne Quisumbing, Arcy Gayatin, Cary Santiago, OJ Hoffer, Anthony Romoff. The bold and the brave stayed on and partied till the wee hours of the morning. My one full day in Cebu seemed like a week what with all the activities that Eva planned for me and my guest, Maricel Echiverri. 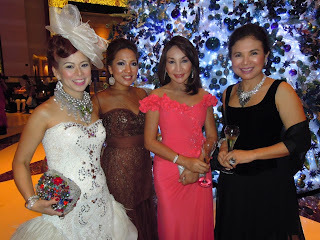 The Crystal Ball held on Dec 15, 2011 was the perfect prelude to the round of Christmas parties during this Holiday season. I am so proud and honored to be a contributor to ZEE Life Style Magazine! Wishing one and all a Blessed Christmas and a Most prosperous New Year! Cary Santiago outdid himself in his current Black Collection!